Yazidi child in refugee camp in Iraq. 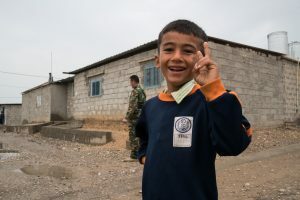 OFWI in partnership with Food for the Hungry Canada has just delivered 1.25 tons of medication and medical supplies worth $500,000 to Iraq and Syria. The supplies were delivered to the Red Crescent Society and are being distributed throughout Iraq and Syria, including to Rojava and Aleppo. These supplies will help treat 20,000 Christians, Yazidis and other minorities in refugee camps throughout the region, as well as those on the front lines fighting ISIS for the next five months. 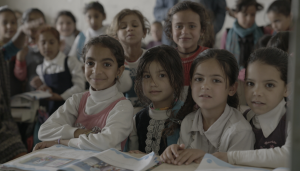 Yazidi children at school in Iraq. To help more vulnerable families and children in Syria and Iraq get medical aid, click here.